My friend Matt B. also sent these Purdy truffles from Canada. OMG, these were so good! The far left one was soft caramel covered in dark chocolate and sea salt, and the next one was milk chocolate covering hazelnut fluff and topped with hazelnuts. But my favorite one was the fourth one, a dark chocolate and coffee truffle that was super rich and flavorful. I have had Purdy’s once before, and this box proved it is a great chocolate maker. Thanks again, Matt! 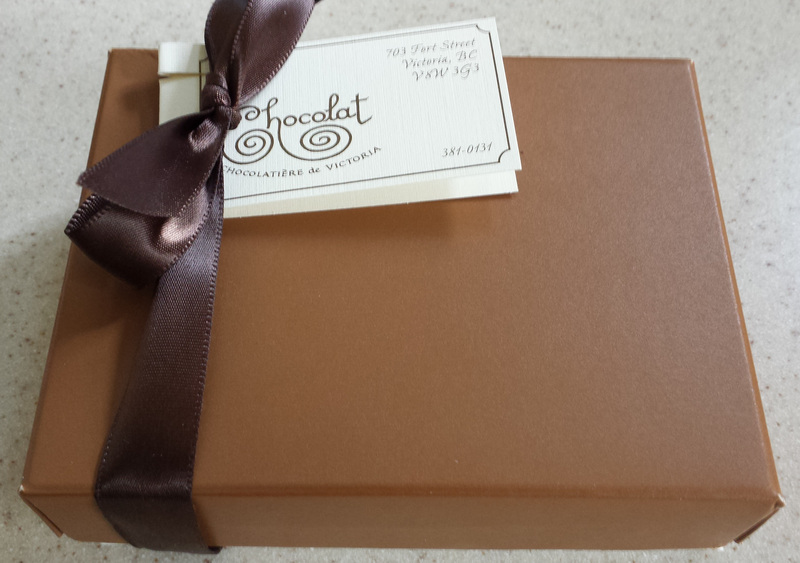 My generous and handsome friend Matt B. lives in Victoria, British Columbia, and he sent me this box of truffles from Chocolat. Inside were a variety of different truffles. Each one was incredible, from the dark chocolate ganache filled truffle covered in cocoa nibs in the upper left corner to the chili pepper chocolate in the bottom right. 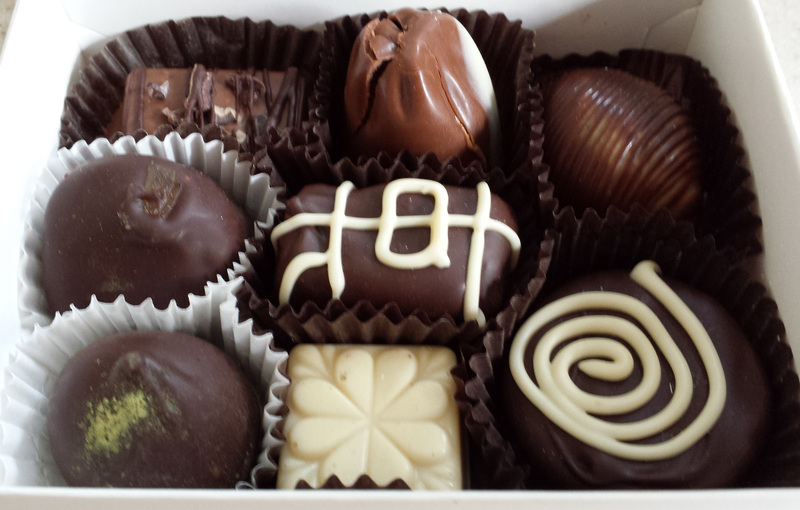 My favorite was the seashell in the upper right, which was filled with chocolate hazelnut cream. So smooth and rich and chocolatey. I let my co-worker Brian H. pick today’s Fazer bar, since he has been very generous with donating chocolate to the cause over the years, and he chose this bar. This bar was very good. Yes, it was milk chocolate, but it was Fazer milk chocolate, which is light years ahead of Hershey or Cadbury. It is rich tasting and not salty or cloying like many milk chocolates. And the biscuit crisps were great! They were bits of butter cookies, and they were very crunchy. I have no idea why they don’t become soft inside the chocolate, but they don’t. And in taste, this bar reminded me of Little Schoolboy cookies almost exactly, and that is a good thing! We continued to sample the new Fazer bars from Finland, donated by Reemi H.
This bar was really good, like all of the Fazer bars. The almonds were in bits and slivers, but there was a lot of them, and the pears were in little dried nuggets, like little cranberry bits. They tasted almost like bananas if you didn’t know what they were, and they went exceedingly well with the dark chocolate. Everyone liked this bar and wanted seconds, which were easy to provide because the bar was HUGE. All in all, this bar was a big hit! 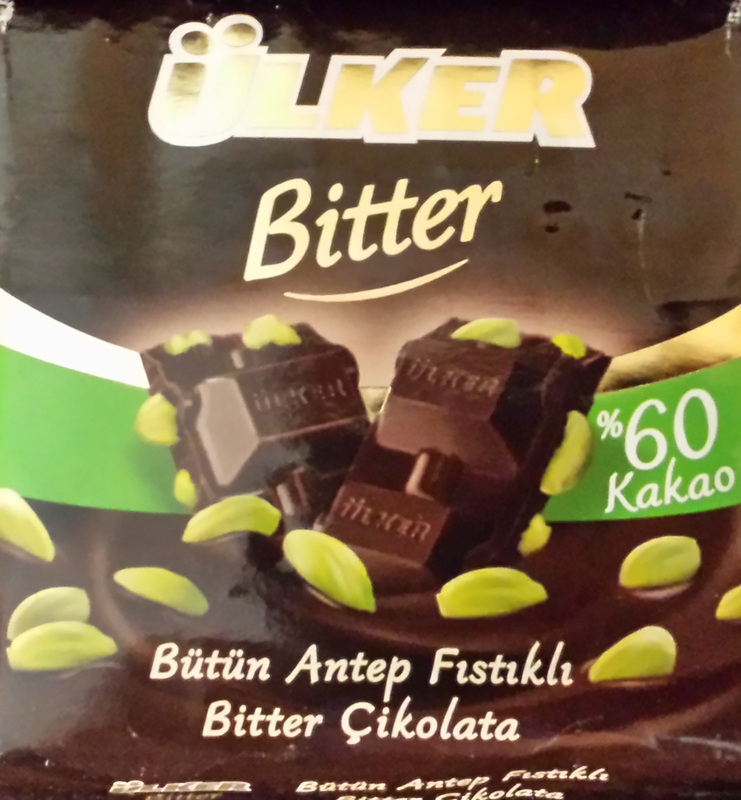 My friend Alper C. sent a big care package of Turkish chocolates, and I decided to start with this one. Wow, this bar was delicious! The chocolate was dark and rich and tasted a lot darker than 60% cacao. And the pistachios added a great flavor and lots of crunch. This bar reminded me of rocky road ice cream, and everyone who tried it loved it. I let Roby A. select today’s Fazer chocolate from the big box from Reemi H. in Finland. This was a very good milk chocolate bar. While I like their dark chocolate better, the Fazer milk chocolate is very smooth and rich, and it has a caramel aftertaste, probably from the milk and cooked sugar. This would not be an every day “go to” bar for me, but it was a nice change of pace from dark chocolate. And wow, was it big! I shared it with seven other co-workers and some people had seconds, and a few had thirds. I let my co-worker Brian M. pick a Fazer bar out of the big box that Reemi H. sent me, and he picked this one,. This bar was HUGE, easily twice as big as a regular sized bar. I broke it into big pieces, and with half a dozen people tasting it, everyone could still have seconds and thirds. And it was really good! The excellent Fazer dark chocolate held chunks of dried apple, bits of caramel and chopped hazelnut. It tasted like a chocolate dipped caramel apple, rolled in nuts. Fantastic.